Ayurvedic Treatment in India is an age-old practice — for harmonious revitalisation of mind, body and soul. This brings about natural balance, or homeostasis, in the best manner possible. Ayurveda's popularity is growing each day, around the world. People, from all over the world, come to India to experience the magic of these ancient rejuvenation therapies. Agni-Ayurvedic Village has gained immense popularity around the world for Ayurvedic Treatments. It is considered as, perhaps, the best destinations to get your complete rejuvenation treatment. The facility has over 18 years of experience and provides high-class service that is unmatched elsewhere. Just visit us at our amazing destination and get the best rejuvenation and wellness treatments amidst sylvan, pure and natural surroundings and experience total freedom from all your, known or unknown, physical and psychological issues - with the help of our authentic ayurvedic treatments. 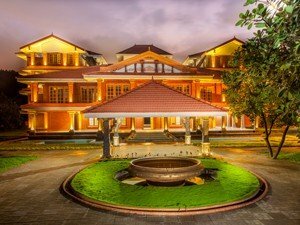 Our facility is spread over 63 acres of lush greenery and natural surroundings. A sight to behold and savour with your mind, body and soul. You can choose from a range of rejuvenation therapies, especially designed with you in mind and your unique individual needs — to help you reclaim your true, natural self and Well-being. In other words, experience our holistic, customised, or bespoke (personalised) Ayurvedic approach — for a higher purpose as regards your health and Wellness. What are you waiting for? Just visit Agni – Ayurvedic Village, because it takes a Village to experience rejuvenation, from the inside out for optimal health and wellness.